Be Like Edgar: CHOOSE To Be Outstanding! As we write in the Outstanding! book, employers must begin to “hire character over credentials.” Organizations would do well to focus less on college degrees and more on candidates with strong character. 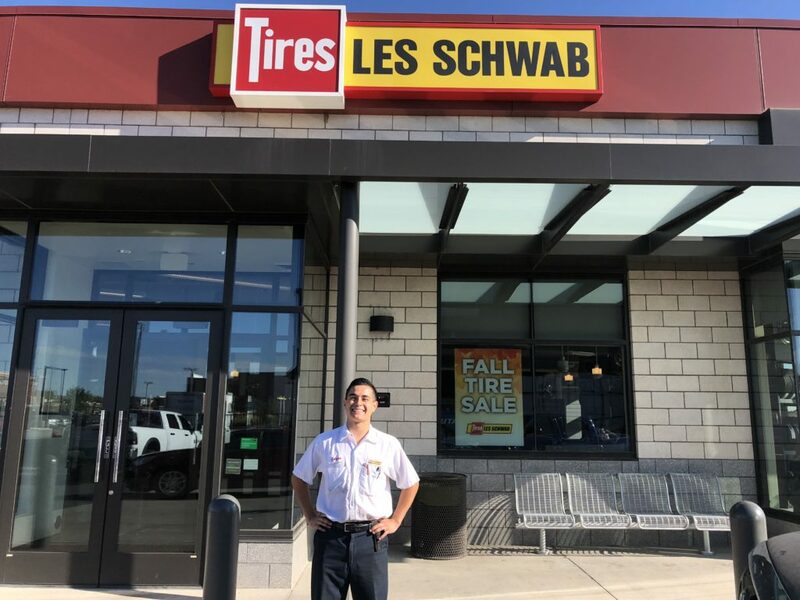 We get our vehicles serviced at our local Les Schwab Tire Center. Schwab is conveniently located only two miles from our home but the main reason we always go to Schwab? Edgar, age 22, is a shining example of what a young person can do and become. Yes, the entire Les Schwab staff is courteous and helpful, and store manager, Jeremiah, gets credit for that. However, Edgar stands out. Which makes him … outstanding. Edgar’s character exudes from him at every turn. What’s so exceptional about this Edgar fella? It could be how politely he says “Yes, Sir” and “No, Sir” to me. I surely don’t demand or need that, but it does tell me something good about Edgar. Are you getting an image of someone you’d be proud to hire? A person of character is a person who is enjoyable to employ. By 10th grade, Edgar was doing poorly in every class. Not much was going well in his life. He did participate on the school track team but “wasn’t very good.” In one race, though, as he struggled mightily in the final lap, heading toward a last-place finish, Edgar heard something he hadn’t heard before: The crowd began yelling loudly, enthusiastically cheering him on. It felt so good, Edgar kept going. When he crossed the finish line—last—all of the high school track fans stood to applaud. As Edgar received a standing ovation from mostly strangers, he thought, If they’re applauding me for just finishing, then I need to finish better. Do better. Be better. That special character-building moment occurred at the end of Edgar’s sophomore year, at just the right time in his life. Edgar retired from track, but over the next two years pulled straight As. Becoming a model student, he graduated easily and chose to immediately go to work—at Les Schwab Tire. Edgar’s character, as it is for all of us, is the sum total of his choices. Possibly, some of those positive choices were driven by one moment in time when people eagerly honored him for his effort on a high school track field. On that day, Edgar made a choice, a decision, to become an outstanding person, one of character. There are several messages in Edgar’s story, such as choices build character, change can happen, and the power of encouraging others, especially young people. What’s the #1 lesson you draw from the story of Edgar? We’d love to hear! Please visit and like our Facebook “Be Outstanding!” page! Made My List, Checked It Twice. Your Turn! The Workplace: Do People Want To Work? It struck me that it’s important to encourage others, even though they may appear to be a lost cause. That support is so easy to give (it cost the crowd nothing to cheer Edgar on), yet immensely impactful to someone struggling. Even a small gesture can make a huge difference in someone’s life. My first thought was he didn’t quit before crossing that finish line; “A” Plus for that. He took the applause and turned it in to a better him. He had it inside of him but just had never seen it in himself until that one pivotal moment. Makes me realize that we all need each other; how we treat and encourage one another can make all the difference in the world. Look at what it did for Edgar. Genuine encouragement has the fuel to release the character that was already within us. It justs needs an ignitor. When I reflect back on my life, whether it be work or ministry related, I become mindful of the many people who believed in me more than I believed in myself. I am so thankful they did, because that truly made all the difference in my journey! The lesson I took away was, what a great story for the Edgars of the world to be reminded of, and for those “balcony people” who believed in them by cheering them on! I can’t help but wonder how many times one seemingly tiny act has been paid forward, with many more changed lives. I have a choice. The power of choice is powerful and empowering and often forgotten! God gave us a choice to choose Him or not and every choice after that moves us towards something and away from something. Where are your choices moving you to?